The 22nd Annual Vancouver Asian Film Festival Begins! Vancouver, BC – October 3, 2018 – In a well-attended media launch this evening held at the Dr. Sun Yat-Sen Classical Chinese Garden, Lynne Lee, Festival Director of the Vancouver Asian Film Festival (VAFF), was pleased to announce the countdown to VAFF’s much anticipated 22nd Annual celebration of Asian diaspora and diversity in film, set for November 1-4, 2018 at the Cineplex Odeon International Village Cinemas in Vancouver 88 W. Pender St., in Vancouver’s historic Chinatown district. “This has been a momentous year in the film industry when we’ve seen hopeful progress in diversity and representation in Hollywood. We are proud that our voices are finally heard, and cannot wait to share unique Asian stories from around the world with local audiences, many premiering for the first time in Canada. In this 22nd year of VAFF, we are most proud to present a program that is truly 50/50 with half of our films directed by talented women.” stated Lynne Lee, Festival Director. “This year’s program has something for everyone, especially our new documentary program series alongside dramas, comedies, romances, fantasies, and all genres of features and shorts. These are vibrant stories that really serve to showcase the myriad INFUSIAN of Asian experiences both in Canada and world-wide.” stated Vincent Wong, Marketing Director. In 2018, VAFF shines a spotlight upon the diverse artists, agitators, thinkers, and innovators who shape the living experience of contemporary Canadians and the array of influences that inform their work. This year’s year’s theme of INFUSIAN explores the acts of creation that help form an endlessly complex, rich and vigorous society: it tells the stories of individuals and communities blending together old and new, East and West, classic and cutting-edge, myriad ways of living and thinking that draw out the strengths and unique flavours from many different ingredients. It also reflects the undeniable hybridity of modern Canada, with multiple heritages, histories, and cultures both within and outside of the Asian diaspora coming together in countless combinations. The VAFF program continues to showcase the breadth and depth of Asian diaspora filmmaking beyond mainstream film festival offerings, with programming that reflects the increasingly borderless creative and industry sensibility of Canada’s west coast. We are proud to continue our VAFF Industry Insight (VAFF I²) Panel Series with three panels that collectively challenge us with burning questions for our Diversity and Representation in Canadian Film and Television and Asian Women in Film. We welcome the return of the Best Canadian Feature Award, sponsored by the Directors Guild of Canada, as a companion to our longstanding Best Canadian Short Award; the return of our VAFF “Outstanding Contribution” Diversity in Film Award, recognizing an individual who has contributed significantly toward realizing a more diverse arts and culture environment in our shared industry, as well as the various audience favourite People’s Choice Awards, all to be presented at the Awards Ceremony on Closing Night. View the 2018 Vancouver Asian Film Festival Guide below on issuu.com! the Canadian premiere of S. Louisa Wei’s documentary ” Havana Divas”, Two stage sisters living in an era of revolution. Four opera trips crossing the ocean of time. We are proud to bring Vancouver audiences 12 Canadian premieres; 5 World premieres, and an additional six films that are Vancouver premieres. This year, exactly 50% of the Directors are females. Over thirty filmmakers and panelists, from Canada and internationally, are expected to attend. Organizers anticipate close to 4,000 audience and industry members over the four-day festival. The Best Canadian Short Award will be presented to one of six nominated eligible short films, and the Best Canadian Feature Award sponsored by the Directors Guild of Canada will be presented to one of three nominated eligible feature films. We will also be presenting various People’s Choice Awards and our VAFF “Outstanding Contribution” Diversity in Film Award during the closing night screening and awards ceremony at the evening of Sunday, November 4th. The Saturday, November 3rd afternoon VAFF Industry Insight (VAFF I²) Panel Series provides a forum for discussion of Diversity and Representation in Canadian Film and Television and Asian Women in Film. 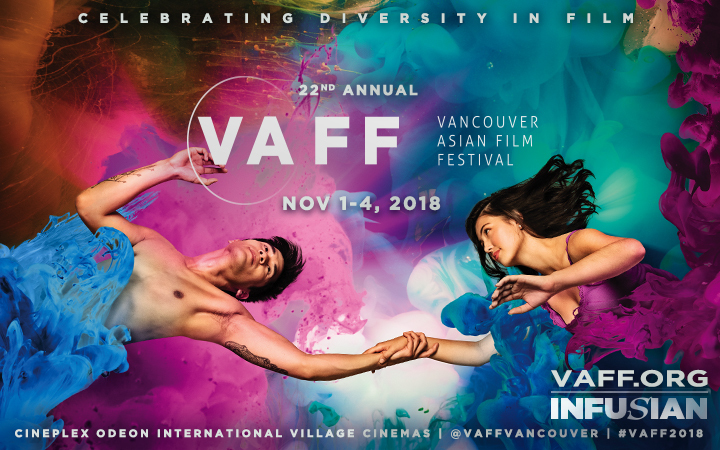 The 22nd annual Vancouver Asian Film Festival will take place November 1 to 4, 2018, at the Cineplex Odeon International Village Cinemas, 88 West Pender Street, Vancouver. The entire program schedule is now available; tickets are now available online at VAFF.ORG, or at the VAFF ticketing table located in the lobby of the Cineplex Odeon International Village Cinemas, 88 W. Pender St,. Vancouver, starting November 1. Interviews and photo opportunities are available. Additional releases, images and screeners/links will also be available. Please email media@vaff.org or visit http://festival.vaff.org/2018/media-accreditation/ for media accreditation forms and other information. The Vancouver Asian Film Festival Society (VAFF) is a not-for-profit organization that celebrates diversity in film. The longest-running Canadian film festival of its kind, VAFF was founded by independent filmmaker and writer Barbara K. Lee in 1995 and debuted in September 1997. VAFF is entirely organized and produced by a group of dedicated volunteers, and is made possible by generous financial support from corporate sponsors, public funders and private donors.